New San Leandro — The Video Debut! The City of San Leandro proudly presents New San Leandro – the video. This video is the second in a series of videos designed to showcase San Leandro as a city that is transforming itself into an innovation and technology economy. In the City of San Leandro – We Make Things! We’ve always made things — and this City’s industrial companies have always operated as advanced manufacturers. Today both established and startup businesses are using the new tools of technology, including fiber optics, lasers, robotics and other techniques. The companies are creating well-paid jobs that offer professional paths for the millenial generation in San Leandro and throughout the region. 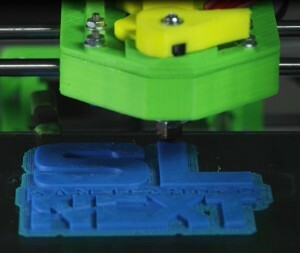 A 3D printer at Omnom Project prints out the San Leandro Next logo. We are indebted to all who participated in the filming of this video. Watch, learn and enjoy — the New San Leandro! We invite you to become part of the beginning. Love this opportunity for our San Leandro, and perspective advertisement . Looking toward to more connection of this sort! welcome to the new San Leandro… Great job! What an exciting time to live in San Leandro. This video demonstrates the dynamic power of an area so deeply rooted in its community and simultaneously hungry for active participation in shaping our global future. Thank you San Leandro leadership and visionaries who have stirred these next generation dreams into an inviting reality today! We have all the ingredients right here in San Leandro. Now we have a map to where these ideas are being stirred. I want a seat at this table! We appreciate your appreciation! If you want to get involved, stay tuned to San Leandro Next and stay informed about the evolution of events, education and more in 2014 under the San Leandro by Design brand. San Leandro — we don’t have to invent our innovation ecosystem, we’re already surrounded by one that is rapidly evolving and growing.